Name of Patent Window Package Box Patent Applicant Guo Shiqing Principal Applicant Address 266071 Level 3, Hong Kong and Macao Building, 27 Shandong Road, Qingdao, Shandong Province Qingdao Yiwei Gift Manufacturing Co., Ltd. Inventor Guo Shiqing Application (Patent) No. 200420009787.X Filing Date 2004.11.29 Approval Date Approval Notice No. 2749811 Audit Notice Date 2006.01.04 Instruction CD-ROM D0601-2 Main Classification Number B65D5/00 (2006.01) I Classification Number B65D5/00 (2006.01) I; B65D25/54 (2006.01) I Division Original Application SUMMARY OF THE INVENTION The utility model discloses a window type packing box, comprising a box body, wherein the box body is surrounded by the interleaving and insertion of cardboards constituting the box body, and a window is opened on the front surface of the box body. There is a stringing hole on the back, and an inner retreating platform is arranged on the bottom surface of the box body. The front left side, the front side right side and the rear side of the inner retractable platform are respectively provided with a tongue edge, and the rear tongue edge is inserted into the box body. In the opening at the back, the front, left, and right sides of the tongue are supported on the inside of the box. This staggered plug-in, through-the-window window box is meticulously affixed with metal nails or adhesives, and the window is made of PVC paper, which is more safe and environmentally friendly. The utility model has greatly improved the visual display range of the product by ensuring that the product is firmly attached in the box through the internal retreating platform and the transparent display window design. Sovereignty item 1. A window type packing box comprising a box body, characterized in that: the box body is surrounded by the interleaving board of cardboards constituting the box body, a window is opened on the front of the box body, and is opened on the back of the box body; A threading hole is provided on the bottom surface of the box body and an inner retreat platform is arranged. The front left side, the front side right side and the back side of the inner retraction type platform are respectively provided with a tongue edge, and the back tongue edge is inserted into the back of the box body. Inside the opening, the left and right sides of the tongue are supported on the inner side of the box. 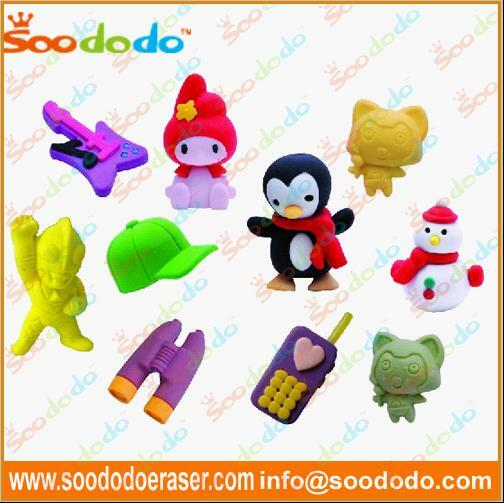 A variety of gifts, trinkets shape eraser .Beautiful and lovely .like 3D snowman shaped eraser , 3D guitar shaped eraser, 3D cellphone shaped eraser etc . Our Gift Eraser is good in quality and competitive in price. We are supplier of Gift Eraser following your specific requirement. If you like our 3D Gift shaped erasers pls contact me , We would provide professional 3D Gift Shaped Eraser with good services for you ! We have many kinds of bright colors for your choice, like 3D snowman shaped eraser have some red yellow white black, 3D guitar shaped eraser have some blue purple black fuchsia ,3D cellphone shaped eraser have some purple yellow pink etc ,can also be customized according to your request .